I said going into this week I’d be fairly happy treading water this gameweek and ultimately that’s what happened. I can’t help being a bit disappointed though considering that on Tuesday evening I was sitting with a GR of 167k and an OR of 150k. I did think to myself though I kind of needed to be well ahead of the game at this stage, with no City defence, no Chelsea defence and no Eden Hazard going into home matches for City and Chelsea that were absolute clean sheet bankers. I guess being philopsophical, I’ve kind of got away with it in terms of not deploying any chips on a double week and have also managed to carry my transfer. So let’s look at things further, I had 7/11 returning players though Geeks metrics for returning players kind of go out the window for the double. Then there was my GR of 1.5 million so slightly over what you need for a green arrow. Then there was my bench, a painful 32 points sitting on the sidelines including double figure returns from Hojberg and Guaita. 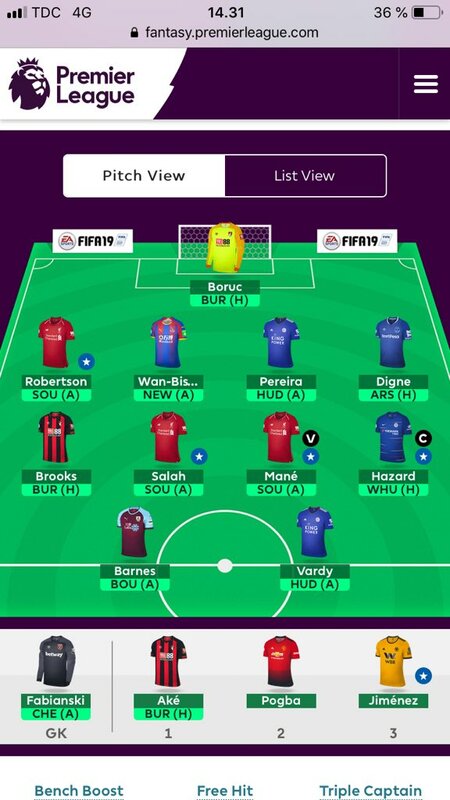 This is where I kind of feel this was the week that got away – my plan a few weeks back was to Bench Boost in GW32 but I changed this based on the fact that my 3 outfield bench players only had a single game. This was then compounded as I also went for the wrong keeper this week expecting Guaita to lose his place; he’s kept it for the moment so hopefully this bodes well for him playing in GW33. The stars for my team this week were Jimenez, Mili and Aguero. The disappointments were Jonny, Pogba and Sterling. Reflecting overall all though, I should be grateful to be where I am considering I was sitting at 900k just 10 gameweeks ago. It’s been a good run since my second Wildcard and I’ve only one more tough gameweek to negotiate before I can focus on GW35 and my Bench Boost. Onwards to blank GW33! When I started to plan for these chaotic gameweeks back as early as GW23, this was always the gameweek I feared would cause problems for me. Transitioning from a blank to a double and then going back to a blank again was always going to be hard with no Wildcard. As such the reality is that I enter this week with only 7 players (provided they are all fit) but at least I have 2 transfers in the bank. 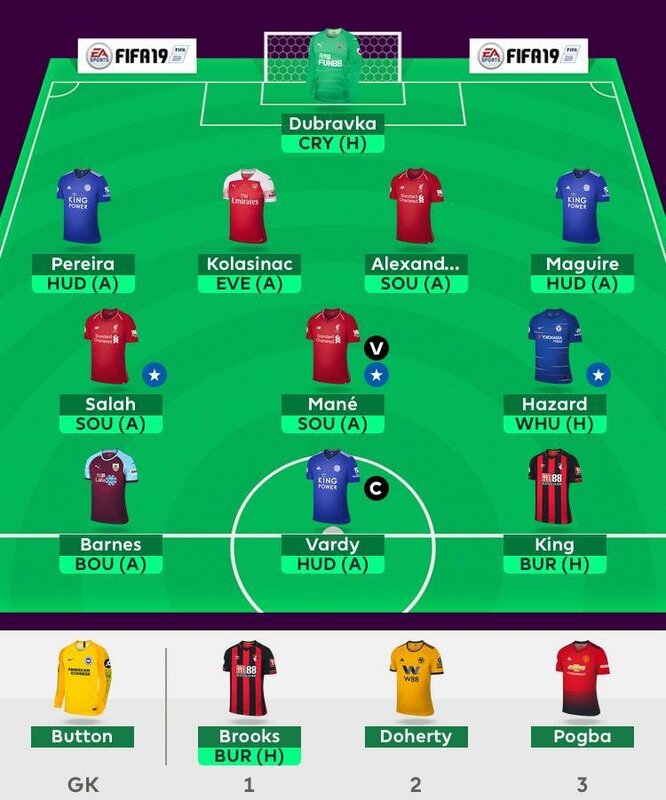 I also now have non-playing Luke Shaw suspended (so he’ll miss GW34 and one of the GW35 games) and 3 players yellow flagged (non-playing Aguero and Rashford and playing VVD.) Finally, of my 7 players I also have no strikers. I therefore need to use my 2 free transfers wisely, getting in players for this week but also paying attention to my squad with respect to my Bench Boost in GW35. So for transfers out, Shaw will definitely go. I then have to decide who to sell out of my strikers. Jimenez is staying, so it’s between Aguero and Rashford. It boils down a little to who I want to keep for GW34 and I slightly prefer Rashford’s home fixture to West Ham so I’ll be selling Aguero. For players coming in, I’ll be bringing Kolasinac in for Shaw – this has half an eye on GW35 where Arsenal have a double (though as we saw in GW32 with many of the teams there is no guarantee he’ll play both fixtures.) For Aguero, I’m looking a little more short term and I’m going to bring in Jamie Vardy. He’s not got a double in GW35 but he’s got great fixtures this week and next and I wouldn’t be disappointed to hold him as a single gameweek player in GW35 if I have to where Leicester go to West Ham. I was tempted by one of the Arsenal strikers, but Emery’s team selection is so volatile that I’m nervous even of my Kolasinac for Shaw move! I am kind of tempted to take a -4 this week as well to get me up to 10 players, but I’m not 100% who I would sell to do this. I’ve already mentioned I want to hang on to Jimenez and Rashford and I don’t want to sell Sterling seeing as I’m selling Aguero. Pogba would be a possibility for a sale seeing as his form has dropped off but I’d kind of like him for the West Ham game in GW34. The other factor that throws me off is that I’m intending on taking either a -4 or a -8 next week. This sounds pretty rash considering I’ve taken no hits since my Wildcard in GW23, but it looks a good calculated risk to me. 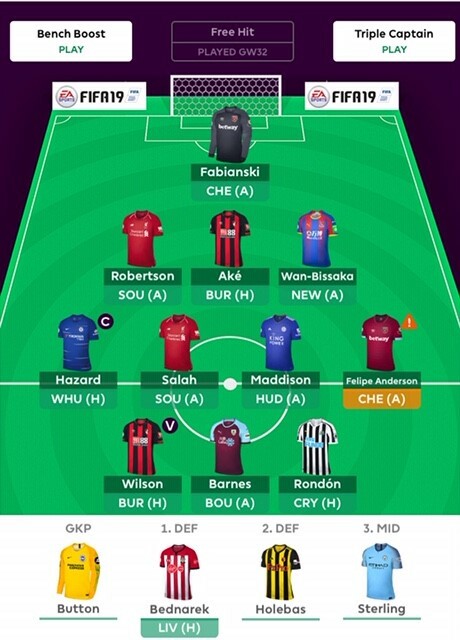 My plan would be to sell Guaita for Ryan, which gives me the Brighton keeper for 4 fixtures over 2 gameweeks and I’m tempted to do the same in defence by changing AWB for Dunk or Duffy. I’m then also tempted to sell Mili (who plays City in GW34 and has a single fixture in GW35) for Son (who plays Huddersfield in GW34 and has a double in GW35) I’m not 100% set on this and we’ll have to see what happens over the next week. 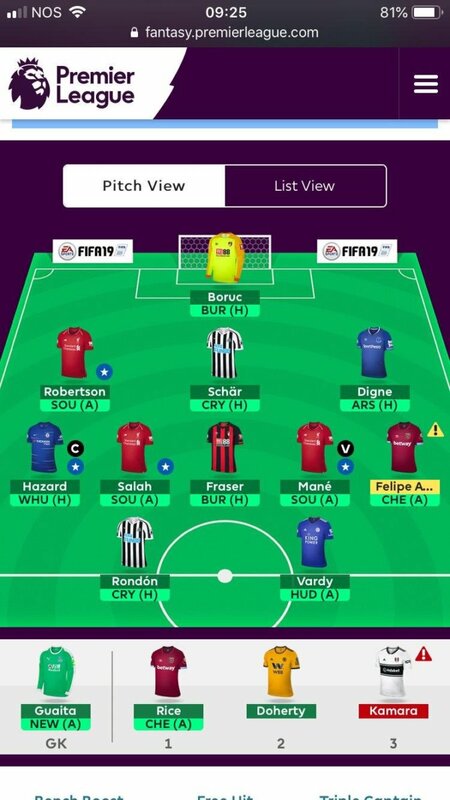 The last decision this week is captaincy and it’s a straight battle between Salah and Vardy. Salah will likely be more heavily backed, though his attacking output has been stifled of late by a change of position and some aggressive marking by the opposition. Vardy is therefore very tempting – opponents Huddersfield are a tougher proposition at home and may relax and play more freely now they have been relegated. But Vardy is in good form and could expose the Huddersfield backline fairly easily. It’s a tough call and I’ll be honest, if I had Hazard or Mane this week I’d probably favour one of them. But I don’t, so at the moment it’s on Salah but I’ll tweet if there’s any change to this. Best of luck for this week folks and may your arrows be green! Transfer summary. To be confirmed. Prakhar used his free hit chip in GW33. He has all his others intact. Transfer summary: Rondon in for Mitrovic. Keith has played his triple captain chip and played his free hit chip last week. All others are in place. Transfer will either be Anderson to a Leicester midfielder or Rice to a Chelsea defender. Hoping one of my GKs start. Mikael has played his triple captain chip and is played his Free Hit chip last week. He has all others in place. Alex has used his triple captain chip and used his Free Hit chip last week. He has all his other chips.